When I make lists, they’re nearly always on paper. There’s just something about it. It helps me remember what I’ve written, it’s more present as a list (whereas a digital list might get lost behind multiple windows or closed and forgotten forever), and physically crossing things off when they’re completed is so much more satisfying than striking through. Last weekend (I think) I was brimming with ideas of posts and potential posts for NaBloPoMo (such a crazy, awkward name!). It was only after I finished it and felt satisfied at the length of the list that I realized how very few line items related to books. Hrm. Do you make lists? On paper or screen? This entry was posted in blogging, WordLily, writing and tagged hand writing, nablopomo. Bookmark the permalink. aw, cool! I think it’s fun to see people’s actual physical lists on the internet. maybe all book posts are overrated! Yeah, I’m definitely not aiming for all book posts these days! I run hot and cold with lists. Most times I don’t need them, but occasionally they are useful. And if I make a list, I’ll definitely initially write it out. I might eventually transfer the list to my computer, but that usually doesn’t work out well. I go through seasons of list-making and not, too. Sometimes my brain is too full to keep everything straight and I have to make a ton of lists, whereas if my head is quieter, I can keep things straight without writing it all down. I think we should both do the missionaries in fiction lists, definitely! I have to make all of my lists on paper – they have to be there in front of me. And all of my reminders. You’re so right about them getting lost if you make them on electronic media. I make lists, of a sort, using a note sticky program on my computer. I’m a mad-woman when let loose with post-its! I’m not much of a list maker because instead of receiving a gratified feeling when marking something off, I feel overwhelmed at all the things I have yet to do..so it kind of back-fires on me. Great list! Mine is a little funny looking as its going every which way covering every bit of space on a piece of paper. I need to redo it in my new blogging notebook. 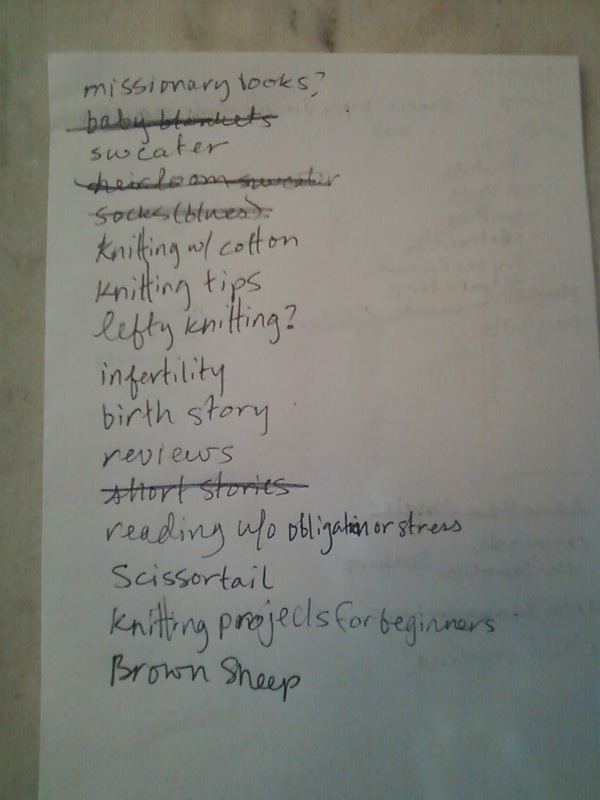 I have so many lists…I need to just consolidate them into one and work through it. Missionary Books, sorry! When I wrote that list, I was never intending to photograph it and publish my hurried penmanship!